**** Chosen by Winner: Anthony B. The Aklys Defense Atlas ($900) is a .30 caliber user serviceable suppressor. This can is a heavy duty suppressor that uses a double threaded interface and modular blast chamber for a lighter weight (20oz and 18oz, stainless or titanium tube option,respectively) but comparable sound performance to the popular and excellent sounding Aklys Defense "Orion." It is built to withstand use on magazine fed machine guns. This is a 300 MAGNUM rated can! The Atlas also functions as a superb multi caliber suppressor, allowing use on multiple hosts from .300Winmag down to 5.56mm. The double threaded 17-4 stainless construction with Nitronic60 blast baffle (10-12% better performance than Inconel) give this suppressor a lifetime of use and it user serviceable design allows use of extensive subsonic and un-jacketed lead projectiles without fear of clogging up the baffles. Minimal and consistent point of impact shift compared to unsuppressed host. Fits the Aklys Defense QD muzzle brake system for compatibility with 14mm LH, 1/2x28, 5/8X24. One brake comes with the suppressor. Additional brakes available at request. So when it came time to bring an optic like this into our mix, we went to the matches and sat at the bench with competitive PRS shooters and professional bad guy hunters alike. It was in these discussions that we learned exactly what the needs of a First Focal plane optic operator may want. True to LUCID Optics ideal we balanced the “Must Have”, list of features and benefits with the “Want to Have”, list of specifications and are proud to introduce the NEW MLX Rifle scope. The Caldwell & Tipton Range Package is the perfect accompaniment for the Long Range Shooter. 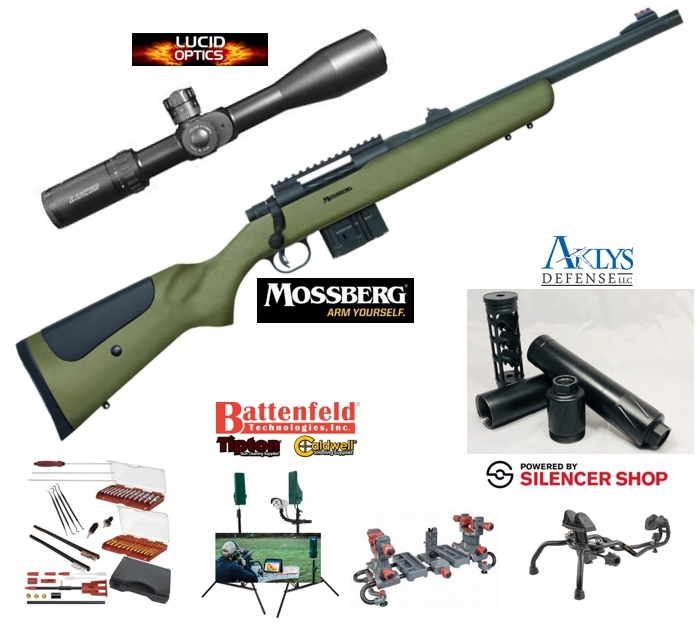 It includes the Caldwell Ballistic Precision Long Range Target Camera ($599), Caldwell Stinger Shooting Rest ($460), Tipton Ultra Gun Vice ($160) and Tipton Ultra Cleaning Kit ($120). You'll find all the details on these below. Eye Relief: 3.6" to 3.1"
The Caldwell Ballistic Precision Long Range Target Camera was designed by our team of engineers to be the best target camera system available today and affordable so all shoot-ers can have one. The one mile range delivers live streaming HD video footage of your target to your smart phone or tablet through Caldwell?s free app. The Caldwell Ballistic Precision LR Target Camera comes with a premium storage case to store the entire system. A free app is available for download on your smart phone or tablet. It allows you to view live streaming HD video, take pictures, record video and can calculate your group size too. The rechargeable lithium ion battery allows you to use the Target Camera for up to 6 hours. If a more permanent setup is desired it features an external power jack to hook up to an alternative power source. 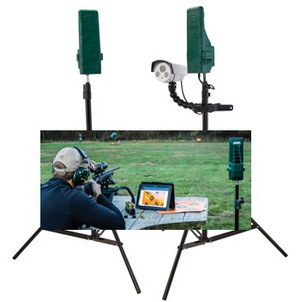 The Caldwell Ballistic Precision LR Target Camera will become one of your best friends on the shooting range and you won't want to leave home without it. The Caldwell Stinger Shooting Rest combines a great looking design, ultimate user functionality and rock solid stability in an affordable rest. Central to the design is the innovative front elevation system. A spring loaded, height adjustment knob allows for fast, one handed coarse elevation adjustment. The new cutting edge molded front and rear supports protect the gun’s finish and provide just the right amount of firmness for rock solid shots. The heavy duty dual metal frame and quick cam locks allow the Stinger’s front rest to easily slide forward or backwards then lock in place when the desired length has been achieved. 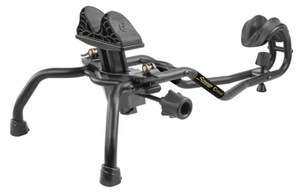 The Stinger Shooting Rest provides versatility and ultimate stability, delivering the shooter maximum accuracy potential. Tipton's Ultra Gun Vise is fully adjustable to fit bolt-action rifles, break-open shotguns, AR-15s, automatic pistols, revolvers, compound bows and crossbows for cleaning, maintenance and upgrading. Modular design allows you to switch up the module assemblies in any configuration to fit virtually any shape firearm. Comes with an AR block that provides a premium base for working on your AR-15. 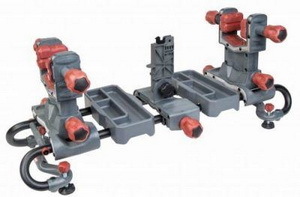 Independently adjustable front and rear clamps hold guns securely and are both height and length adjustable.The extra-wide vise delivers up to 26.5" of clamping distance. Fast-turn knobs ensure quick clamping. Overmolded rubber contact pads prevent damage to firearm. Glass-filled nylon construction with stainless steel reinforcing plates adds rigidity and strength. Leveling feet for easy scope leveling. Movable, removable accessory/tool trays are constructed of stiff, solvent-resistant nylon for years of dedicated firearm cleaning. 32.5"L x 11"H x 10.5''W. • Modular system allows you to clamp components like AR Upper assemblies without needing to have them attached to the lowers. The Tipton Ultra Cleaning Kit was designed for the shooter that wants the absolute highest quality cleaning accessories available in one convenient portable kit. The heart of the kit is a Premium 3-piece Stainless Steel Cleaning Rod with multi bearing handle. The .205 dia, 40" usable length rod is constructed of 17-4 PH stainless to be extremely durable and resist taking a bend (the problem that plagues most multi section rods). The kit features Tipton's 13 pc. 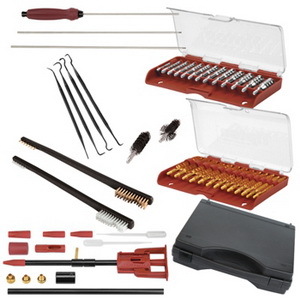 Utra Jag Set and 13 pc. Best Bore Brush which both deliver industry leading performance. Also included is Tipton's innovative RAPID Deluxe Bore Guide Set, which enhances the ability to clean any rifle. A variety of picks and cleaning brushes round out the assortment in the kit. All components are neatly contained in the molded plastic case with custom die cut foam for organization. For use with .22 cal and larger rifles.